Men are on one side of the room, women on the other. 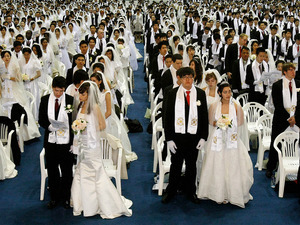 Matched or engaged couples sit at the back. They open with songs from the ’60s — “Eight Days a Week” and “If I Had a Hammer” — anthems from their parents’ generation. These are “blessed children” — according to church doctrine, they were born without original sin because their parents were married by Moon, whom they consider the Messiah. Their plan? Update the music. Plus: Another win for Pagans, the Dalai Lama isn’t worried about fancy stuff, fashion designer says don’t buy clothes, and I don’t know what to think about the Internet anymore.